So adorable!! The poms on the bottom give it that “extra” style I was looking for!! Looks great with the modem grey comforter I purchased as well! Bed skirts make it possible to store items under your bed without interrupting the visual flow of your decor. This Nucifera linen bed skirt from the Copper Grove collection hangs from beneath your mattress to the floor to maintain a clean visual profile and help you to better organize your room with under-bed storage without sacrificing style. This was so easy to put on my bed! I actually put this on my bed without having to unmake my bed and take off the mattress like I would have with a regular bed skirt. This is the perfect style and matches my quilt with pom poms perfectly. The bed that this is on is on the plastic risers and the bed skirt is long enough that it covers them. Would definitely recommend! This is the cutest bed skirt with Pom Pom fringe on the bottom. The color and quality were exactly as described. I will say be careful not to step on Pom Pom fringe as they will fall off if you pull too hard. this is not 18 inches deep. more like 12. they are counting the elasic, which you do not want to see. Also, once you open the package to look at the item, it is no longer returnable. Be warned! Now I cannot return this piece of junk and have to purchase another one. But never from this company!! Also, it is see thru sheer material. Piece of junk!!! It’s a very cute bed skirt, however it does not have split corners. I ended up taking it apart and making them myself. But otherwise I highly recommend it. Second one of these we have bought. Super easy to put on and take off for cleaning. Hangs nice an long from the bed and you can adjust it easily. We have it in white and in taupe. Perfect product. LOVE this! I was a little apprehensive, buying an adjustable/elastic bedskirt. (I never bought one before) Went on with ease- and looks great!! It is in a guest room, that being said- the bed is not used often. Not sure how well it would stay on for everyday bed use/making. Looks great though! Adorable with the pom-poms, great for a Shabby chic/farm country feel! Pom Pom fringe! What could be cuter and what could be easier than an elastic bedskirt!!! This is a breeze to put on a bed. I got the queen size and it's easy to put on and take off. It holds up perfectly when washing (quick wash setting). I partially dry it, place it back on the bed and then straighten the skirt using my hands to ensure it doesn't dry with any wrinkles. Once fully dry it is crisp and yes, no wrinkles! CUTE! Easy fit for my full bed. Pom poms are darling. I love the pom pom detail on this bedskirt. We have received so many compliments! Bought it for my daughter's bed and it is perfect. We ordered the grey, which is more like a greige perfect for what we wanted but just FYI in case you need a darker grey. I ordered this item in white, but when it came, it is more of an off white and did not match my bedding. It is also very thin and needs a liner. Sending back for a refund. Really cute with the poms. looks great on the bed. I really love how easy it is to put on! Too cute, and love that I can just pull it off to wash it. Don't have to remove mattress. I love the look, super easy to put on. It does pull down. Love! Love! Love! Fits perfectly and looks great. The Pom Pom fringe on the bed skirt adds the perfect touch of country charm. Also, thanks again to Overstock for the super fast shipping! Adorable bed skirt. It looks perfect on my bed. Very cute for my daughter's sorority room. Also love the matching valance. GOOD FIT. WOULD RECCOMEND TO FRIEND. I bought this to go with the Copper Grove Burrell blue cotton coverlet set. It adds a beautiful finishing touch. Also, since it’s adjustible and fits around the mattress instead of under it, it is so much easier to use. Beautiful and dainty and perfect for a guest room or a girl’s room. Very pleased with my purchase and would definitely recommend. Great idea for a bed skirt and I love the tiny Pom poms. It is plenty large enough to cover three sides of the bed. I would have given this a five star rating but found it necessary to pin and secure this to the box spring. Being on elastic it can slide each time the sheets are changed if it is not secured. But since I hated removing one with the full fabric to clean it, I consider that a worthwhile trade off. 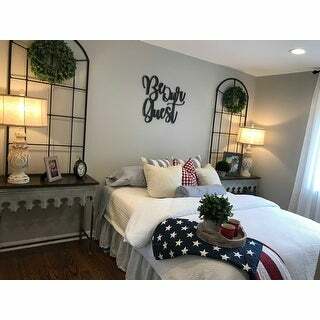 It serves the purpose of a nice dust ruffle with flare, however, it is hard to keep in place with daily bed making, might consider tacking it to the box spring. "Has anyone used the Queen/King for a California King sized bed? If so, how was the fit?" The Queen/King bed skirt would not fit a California sized bed/mattress. "Does this actually fit OVER the box spring and the mattress sits on top or does it just wrap around the box spring?" It does not fit over the boxspring, but is adjustable and fits around the mattress. NEEDED A BED SKIRT THAT I DID NOT HAVE TO LIFT MATTRESS. It will easily convert to fit and hide the rails if my custom bed. "I want the more yellower color and don't know if that's ivory or camel since they're not labeled.. would anyone know which is the more yellow?" I think the Ivory is more yellow than the Camel one it seems beige. I bought the white one for my little girl and it gives her room a great touch. "Which one is the camel? And which one is the beige? They're not labeled.."